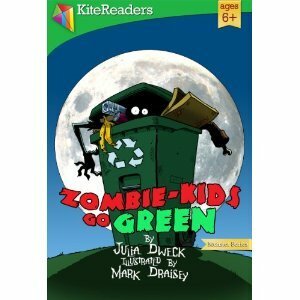 Zombie Kids Go Green is about a group of zombie kids that help clean up the environment they are in. The book is written in prose and is quite short. I couldn't find any purchase links, and frankly, it's been on my Kindle so long now that I don't recall how I acquired it. It's written in prose and it's lovely. The author uses clever words to engage the reader, young or old, and teaches them even smelly zombies love the Earth enough to care for it. The illustrations are awesome too. Great job, Mark Draisey. I really enjoyed this little book a lot. If you're a zombie fan, check it out. To find out more about the author, Julia Dweck, and her books, check out her Amazon book page, Goodreads, Facebook and Twitter.